nosebleeds « Howard J. Bennett - Pediatrician and Author in Washington, D.C. The reason these situations lead to nosebleeds is because they all irritate the lining of the nasal septum (this is the name of the cartilage that separates your nostrils). The best way to prevent nosebleeds is to deal with the underlying condition. In addition, it helps to moisturize the lining of the nasal septum by rubbing a thin coating of petroleum jelly along the septum. (Some of my ear, nose, and throat colleagues prefer saline gel products that can be purchased without a prescription.) 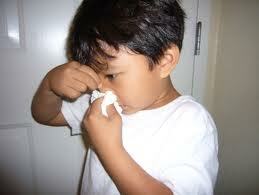 Most kids prefer to do this themselves because they do not want anyone “messing with” their nose. If your child falls into this category, show her how to do this by demonstrating the technique on yourself: the product can be applied with a cotton swab or with an index finger after your child washes his hands. Apply the lubricant once or twice a day as needed to keep the problem under control. If your child continues to get nosebleeds, discuss the situation with your doctor. Most people do not know the proper way to stop nosebleeds. The methods I hear about most often include putting a cold compress on the bridge of the nose, leaning forward, or having the child tilt his head back so his nose is pointing up in the air. The reason such remedies abound is because people do not realize that 95% of the time, the bleeding is coming from the nasal septum (this is the name of the cartilage that separates your nostrils). The best way to stop bleeding is to put direct pressure on the area that is injured. Therefore, the way to stop a nosebleed is to pinch someone’s nostrils with medium pressure for five minutes without peeking. Once the bleeding stops, ask your child to refrain from picking or blowing his nose because that would dislodge the clot and the bleeding could start again. If your child’s nose continues to bleed after five minutes of constant pressure, repeat the pinching procedure for ten minutes. If that does not work, call your doctor.